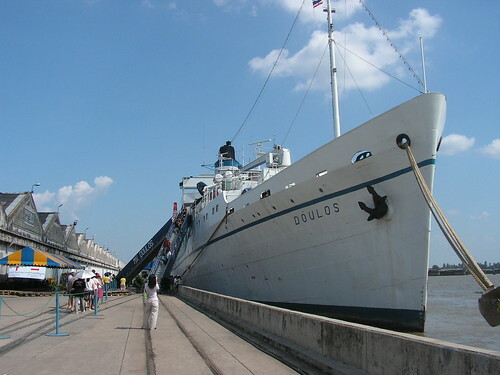 It was like yesterday that MV Doulos made its way to Khlong Toei Port three years ago and now they are back again. I remember wading through sea water since the tide was high when we reached the port! Actually they have been here since July 29 and will stay until August 24, 2009 at the Khlong Toei Port, Bangkok. For those of you who are interested to get some good books or get in touch with its volunteers, you may do so within the time frame given above. It's Doulos fifth visit to Thailand and I thought the last time they stopped by would be their last. The Titanic would have survived this long if it wasn't for the well-known accident because the very fact that MV Doulos is only 2 years younger than the Titanic is almost comparable!